We welcome the opportunity to meet with you to discuss any disability-related accommodations and support services you may need. Richard Bland College of William & Mary is committed to providing equal educational opportunity and full participation for persons with disabilities. 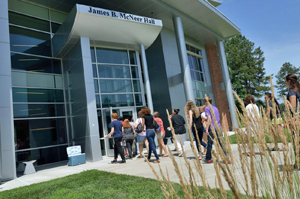 It is the College’s policy that no qualified person with a disability be excluded from participating in any campus program or benefiting from any Richard Bland College activities. This manual provides more information on RBC policies and procedures.